Yesterday I gave my verdict on who won E3 2017 overall. Now, I’m going to dive in and tell you the games I’m most excited for that appeared at E3 2017 during the conferences or were revealed/given trailers/given news separately from the event, but still E3 reveals technically. So lets not waste time on idle chatter. Anyone else here remember Pirates of the Caribbean: Armada of the Damned? Absolutely great looking game and looked like the first true pirate game where you helmed your own ship and amassed wealth and power. Then it got canned. But not to worry, Ubisoft then came out with Assassin’s Creed IV: Black Flag which had absolutely fantastic naval combat. A lot of people wished that the game had multiplayer, or that the naval combat would become its own game. Well, the latter did in fact happen and I am very excited to play it next year. The first Battlefront that DICE developed was a decent attempt at a Star Wars game, but it didn’t feel like the Battlefront many knew and loved. Battlefront II on the other hand is much more deserving of the Battlefront title. It spans all three eras, has a proper campaign, has refined gameplay that is closer to the original Battlefront II, and has space battles. Now all it needs to be perfect is to drop the damn star cards and add galactic conquest. Either way, I’m much more willing to invest in this more complete game with the promise of free DLC. Shadow of the Colossus is one of my all time favorite games and it’s considered by and large to be one of the greatest games of all time. So it’s only fitting then that this gem be given a proper remake for the PlayStation 4 and really shine without the technical problems of the original game and, perhaps if we’re lucky, they’ll add even more colossi to the game as extra’s since so many more colossi were planned, but unfortunately cut. Regardless, I’ll be picking this up day one come next year. Speaking of sounding crazy, people were constantly telling me that I was insane for thinking that Game Freak would make a mainline Pokemon title for Switch. They said I was wrong and that the Switch is not a handheld. Well guess what folks, it is now official: A core(Read: Mainline) Pokemon RPG is coming to the Nintendo Switch sometime in the next year or so. It doesn’t matter if Nintendo officially states the Switch is handheld or not, the Pokemon Company and Game Freak clearly do not agree with that assessment regardless of whom it may come from, as their requirements for a mainline Pokemon game were that the system it’s on be a handheld because that is Pokemon’s home and where it should be. I’m super stoked to see how they handle this game. Will they go big with an overhaul? Or will they play it safe and just make a higher rez version using Sun & Moon’s style? Only time will tell. And now for something that completely blindsided me and many others. The DotHack G.U. trilogy of PS2 games are being remastered for the PlayStation 4 and set to release sometime this year apparently. I never got to play these games back when they were relevant, but I really want too and now I’ll get my chance with a fresh coat of paint to boot. The games systems are being revamped and the graphics are being overhauled(Note: The extent to which the graphics are being changed is up in the air. I’ve read a couple articles that make it sound like a simple remaster like most, but others that make it sound as if the graphics have been overhauled to such an extent that it’s more like a remake than a remaster.). This should make it worth a go for people who’ve been through them once already. I love Quantic Dream’s games and Detroit looks to be shaping up to be something great. Each year we get a new trailer than introduces another protagonist and gives us glimpses into the story. In 2015 we were introduced to Kara and her learning about the world from a more human perspective, last year we were introduced to Conner, a detective of sorts, as well as just how many different outcomes and possibilities there are in this story, and now we’ve met Marcus, a revolutionary who wants to change the world and seems to have a bit more of an active gameplay style compared to the cinematic approach of the last two. I’m hyped, but I want to know when the game is releasing already. I’ll admit that while I own Xenoblade Chronicles and Xenoblade Chronicles X, I have not finished either of them, heck I haven’t even started the original. That being said, I’m still really excited for Xenoblade Chronicles 2 because it just looks so cool. The character designs are interesting, the world is massive, the story has my attention, and the monsters are also massive. That sort of scale feels rare in video games. Plus it’s another title to round out my Switch library. This one is a mixed bag for me. 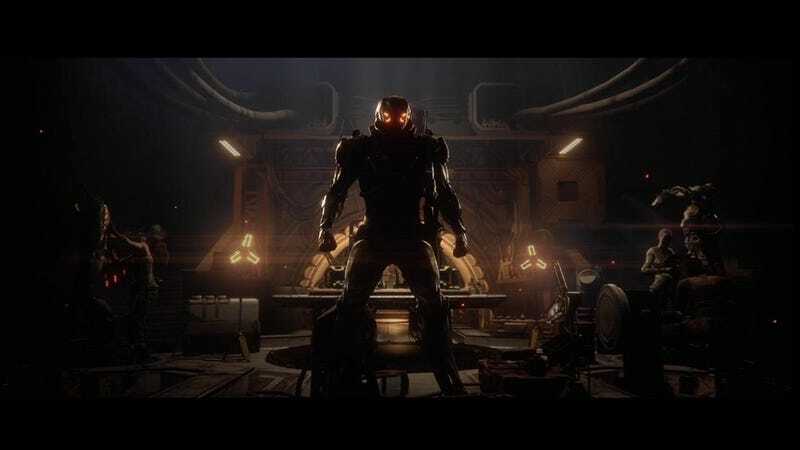 I’ve been very curious as to what Bioware Edmonton, Bioware’s A team(the good one), has had cooking in the oven, and Anthem is it. It looks really cool, visually and mechanically, but I have my reservations. Bioware is known for their complex RPG’s with engaging stories and great characters. Anthem, from what little we’ve seen of it, does not fit that description. It seems more like your standard shared world action RPG than anything Bioware has done before. Perhaps that’s a good thing, but I can’t stop thinking of it as a reskinned Destiny. Hopefully my fears will be put to rest in the future. Just say when it’s releasing already Square Enix. You know the date. Nomura is giving the “final info” next month at D23 which means this game is just about to the finish line. I was hoping for VII Remake more, but I’ll take the long awaited KHIII as a consolation prize for being so patient. I never played the original Beyond Good and Evil, I’ve just heard about how great it is. This game being a prequel to the original definitely makes it accessible to people like me who never played the original and it has this world design that almost kind of reminds me of Space Pirate Captain Harlock and that immediately grabbed my attention. Granted, we probably won’t see the game again for another three years, but I’ll gladly wait to see what the hub bub is about.